I don't have much of a sweet tooth, so making dessert is not usually very high up on my "to-do" list when cooking. However, with a friend over for dinner and the resident sweet tooth out on a course, I was left trying to think of something tasty, but not overly sweet. 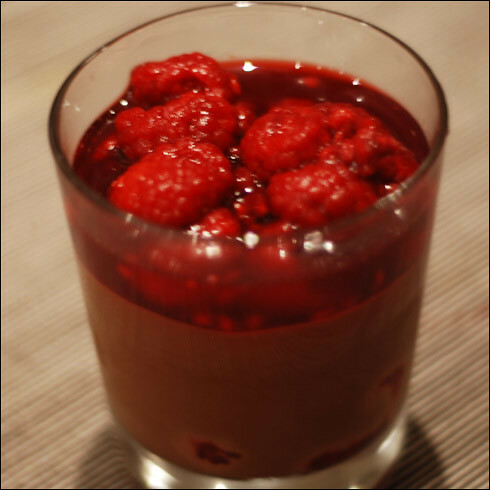 You'd be forgiven for taking one look at the picture below, and the ingredients, and thinking it was a sweet tooth's dream, but the dark chocolate is deliciously bitter and the raspberries, although sweet, also tart. Perfect for a non-sweet tooth like me! This was a surprisingly successful first attempt - I have never made chocolate mousse before. The raspberries proved to be an inspired addition, with the acidity providing the perfect balance to the rich dark chocolate. It is a wonderful dessert to be able to make - it is so quick and easy to make, can be made the day before if needed, and looks impressive, especially if you serve it in martini glasses or wine goblets. About an hour before you start making the mousse, place the frozen raspberries in a bowl and sprinkle with 2 tbsp of icing sugar. Set aside and allow to defrost. Next, place the chocolate in a heatproof bowl within a gently simmering pan of water and gently melt it, stirring occasionally. Dip your finger into the chocolate to check that it is warm, not hot (you don't want to cook the egg yolks) and transfer it to a large bowl. Whisk in with the egg yolks and creme framboise. Whisk the egg whites in another large bowl until they form stiff, meringue-y peaks then mix a couple of spoons into the chocolate mixture, and gradually fold in the rest in two or three goes, as lightly as possible. Stir the raspberries and sugar - they should have lost a lot of juice, which is normal - and then spoon a dessertspoon into the bottom of each container that you're serving the mousse in. Then spoon the mousse on top, add any remaining raspberry and juice to the top of the mousse, then cover with clingfilm and chill for several hours until ready to eat.